Amazon’s Best Selling Fireplace DVD! -Enhance any room as this video of a real fire burns down to ambers and starts up again automatically for hours of relaxation and enjoyment! Plasma Candy BundleSmart Saver Choice! You can also buy this as a single DVD purchase, nothing extra, just what you need. This video has been recorded to provide the best fireplace experience available for your flatscreen TV. Set the mood for a party or create a romantic atmosphere with The Fireplace DVD. It’s HOT! Enhance any room as this video of a real fire burns down to ambers and starts up again automatically for hours of relaxation and enjoyment! 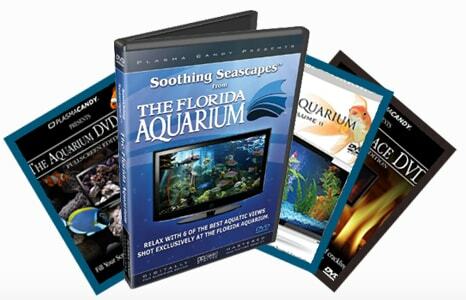 We are so sure that you will love our Florida Aquarium DVD, that we are offering a 100% satisfaction Guarantee. Return the product for a complete refund. © 2016 Plasma Candy Productions.